If you or someone dear to you is afflicted with cancer, or other incurable diseases, join us in prayer in the month of May when we offer two special Novenas in honor of St. Peregrine. St. Peregrine is our intercessor because he knows what we are going through. In his life, he was faced with incurable cancer and was miraculously healed through prayer. And, he helped to cure others. 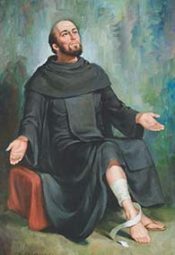 Now through St. Peregrine’s powerful intercession, we will ask that God bless our sick friends and loved ones and help cure them of all physical and emotional ailments. The Novena of Petition will be offered from May 2 to May 10 and the Novena of Thanksgiving will be offered from May 11 to May 19. In addition, a special Mass will be celebrated on May 1, the feast of St. Peregrine. You are invited to share in the consolation of prayer and spiritual renewal by joining our devotions. Please send us your intentions so the names of your loved ones can be placed on the altar of God during these special Novenas. Also, if you can send an offering for our Franciscan missions in Central America, where poor villagers gather wood to cook with and wash and drink from streams. If you can spare $10 or $25 or more, it will help a whole family liver better for a month. So, please be sure to join us in the two Novenas to St. Peregrine. To help you participate in the Novena, I’ll send you a special St. 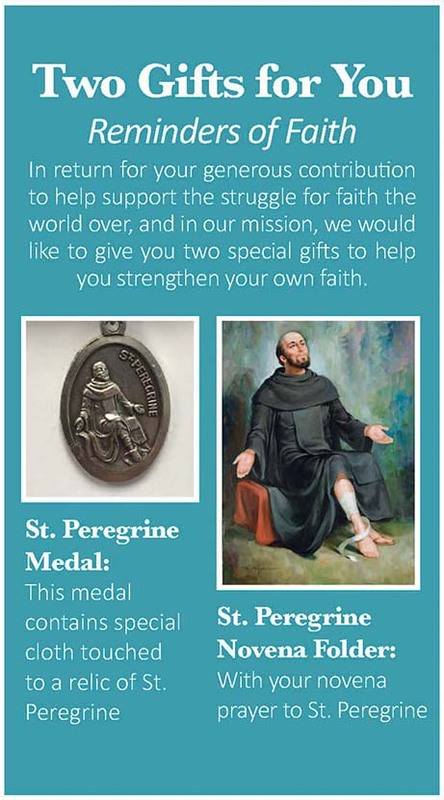 Peregrine medal and folder of the Novena prayers to St. Peregrine to assist as you pray.